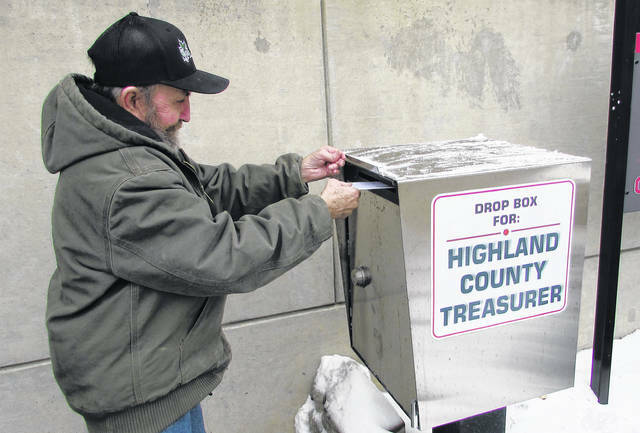 William Holt of Hillsboro is shown using the drop box at the Highland County Administration Building on Friday. Tax bills that were mailed out Friday are due for payment by Friday, March 1, 2019. Highland County Auditor Bill Fawley said the first-half 2018 real estate tax bills were mailed out Friday, and are payable on or before March 1, 2019. The tax statements are being mailed to property owners who are responsible for paying property taxes directly to the county, he said, but those owners who escrow with a bank or mortgage company won’t receive a statement, since those institutions are responsible of taking care of the tax bill. He said questions regarding property valuation, border revision, conveyance, how taxes were calculated, current agricultural use valuation (CAUV) or application for homestead exemption should be directed to the Highland County Auditor’s Office at 937-393-1915. Highland County Treasurer Vickie Warnock said payments are accepted at the county treasurer’s office during normal business hours in cash, check or money order, and debit and credit cards can be used with a small processing fee. She said on-time payments can be made with check or money order and tax bill at the Greenfield and Hillsboro locations of Merchant’s National Bank, or the drop box located at the foot of the steps at the entrance to the Highland County Administration Building through March 1. Taxpayers can also mail their tax payments to Highland County Treasurer, 119 Governor Foraker Pl., P.O. Box 824, Hillsboro, OH 45133. First-half real estate tax payments that are mailed to the Highland County Treasurer’s Office must be postmarked on or before March 1, 2019. Any real estate owner not receiving a tax bill should call the treasurer’s office at 937-393-9951, Monday through Friday from 8:30 a.m. to 4 p.m.